Notes: From the Editor: According to APPP's North American branch (Super Techno Arts), a sequel to this anthology is in the works. Time will tell whether this will come to fruition or not. From Nicoletta Christina: As of 2014, I'm unaware of any such sequel having ever been made. I'm not even going to try and summarize this one. On to the review. 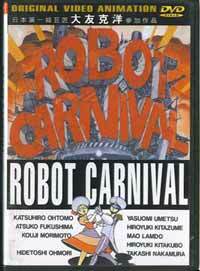 Robot Carnival is a collection of animated shorts (not the kind you wear) by various writers and animators in Japan. The types of stories vary greatly; some are silly and melodramatic, some are abstract and probably highly symbolic, some are deeply moving and haunting, and some are twisted and simply bizarre. All of them, though, are remarkably well animated, and all of them have something to do with robots, or at least mecha in some way. How to summarize it in a sentence? A.D. Cop Rock? Mecha: The Musical? Tales From the Garage? Fantasia II? Amazing Stories goes Anime? Well, whatever it is, it's different, that's for sure. You're probably never going to see anything else quite like this anime. Most of the shorts have no dialogue whatsoever, and are set to music instead. Fortunately, the music is pretty good, nice and cinematic when it needs to be, and fits the action very well. Dubbing is surprisingly good (there's a particularly hilarious short set in 19th century Japan where all the Japanese characters act like they're poorly dubbed on purpose), for what little dialogue there is. Some shorts are more interesting than others, though, and the more abstract ones may make some shift in their seats uncomfortably as they wonder when some action is going to occur. And some make absolutely no sense at all. All in all, a decent watch, if you view it with the right mindset. This might be a fun one to stick in the middle of an anime-fest to get a nice dose of the surreal. Recommended Audience: Nothing terribly objectionable, really. Younger audiences might be bored during some of the slower parts, though, and they probably won't understand some of the shorts (hey, even I don't understand some of the shorts).